This interesting dove bird house is made of cedar wood, and is protected with a natural 100% bio based stain against all weather conditions. The house is made to attract doves, and features a good size base where doves can nest. This Lovey Dovey Original nice looking dove bird house features a nest basket, or base, where doves can make nests out of twigs and building material. The size is perfect for a dove to sit on the eggs, and there is room for two doves when they exchange sitting places. Dove parents usually exchange duties every 12 hours, mom will sit on the eggs half of the time, and dad the other half. They do this so eggs are always warm while they go eat. These dove houses are very attractive but also functional, doves will come and nest in them. The Lovey Dovey Original birdhouse is intended to be placed under an eave. This is because doves love to nest under some protection. It is unusual for a dove to nest in the open, where the nest is seen easy by predators and exposed to elements. Doves love to find a place that will give them some protection from rain. 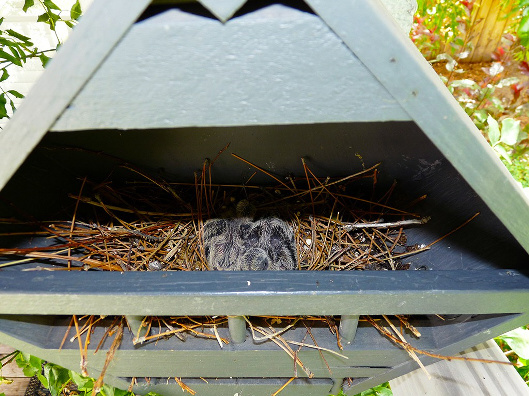 The best place to put a dove bird house is on the inside corner of your eave. You can do this at your house, garage, apartment or shed. Doves love places where they can feel safe and sheltered from predators and weather. Never place a dove bird house in direct sun light, hang it in normal shaded place, doves do not like heat. 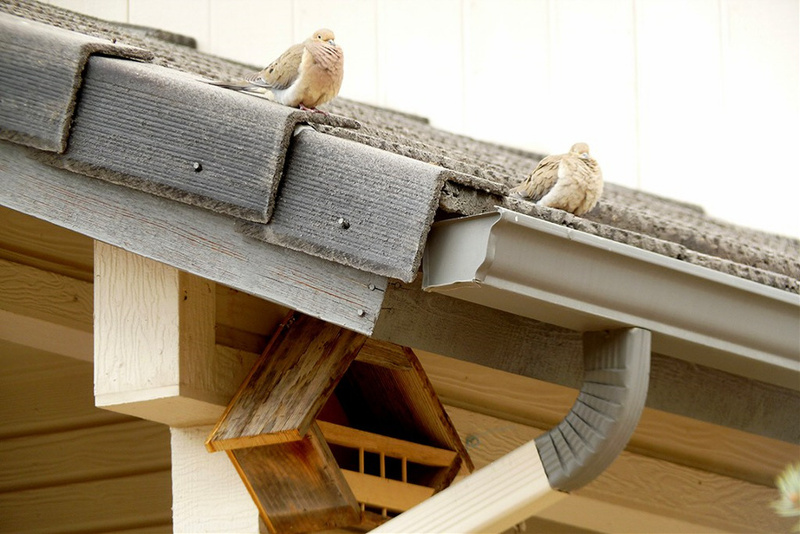 Make sure when you install the bird house that the top corner of the dove house is no more than 1 inch away from the eave from top. And it is best to leave at least 2 inches of space between the side of the dove bird house and the inside corner of your house wall. This is the best place to ensure that other smaller birds do not climb and roost on the top side corners of the bird house. If there is a tree or some large plant next to the dove house will help to attract these birds to nest there. The bottom of the dove house is made to slide in and out of place for easy cleaning. There is a wing nut that you can turn by hand and the moving part will slide. Clean it only if doves are finished nesting. 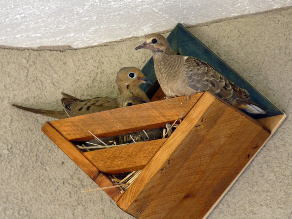 Doves will often nest more than once in season so expect them back soon. 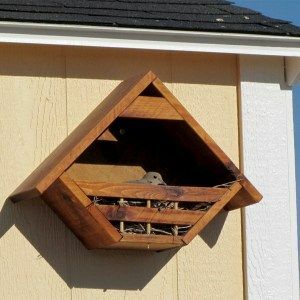 When you install the dove house, it is a good idea to leave some straw or grass material inside. If doves see the nesting material inside it is more likely for them to choose this location. You can put some seed next to a bird house, read what do doves eat here. Doves like to nest next to some kind of landing pad. So it is good idea to hang it next to atree or some other wood post so parents can rest there from time to time. This is because when young are ready to fly parents want an easy access to a landing spot 10-20 yards out. If you have bird feeders in your yard it is best not to place the dove bird house next to it. To much birds will upset the doves and they will not nest there. Young doves can sit on the ground for days after leaving the nest, so if you have a cat put her in door for a few days till the doves fly away. Check Lovey Dovey Original here. Check Lovey Dovey Diamond Dovehouse here.